A military training action drama, G.I. Jane tackles the issue of gender equality in the armed forces but more often than not heads straight towards the most obvious clichés. Veteran Texas Senator Lillian DeHaven (Anne Bancroft) strikes a sleazy deal with Department of Defence officials. The Navy will allow women to prove their combat capabilities by participating in a training program, in exchange for DeHaven facilitating the confirmation hearings for the incoming Secretary of the Navy. 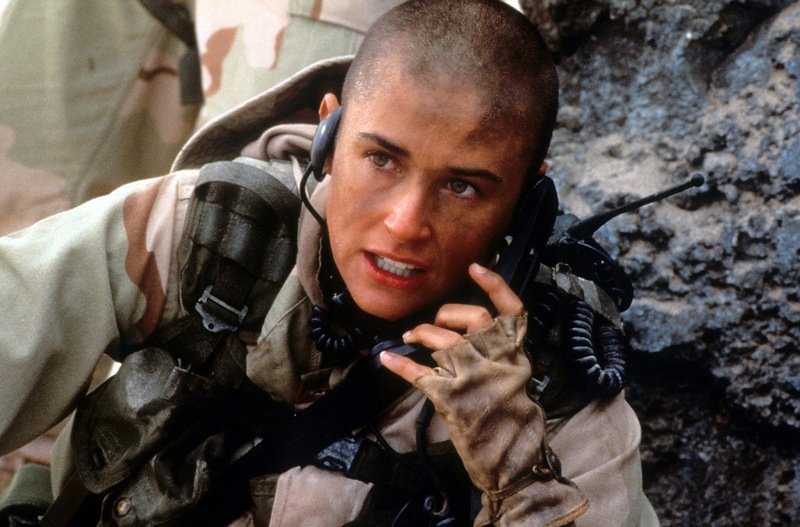 Navy analyst Lieutenant Jordan O'Neil (Demi Moore) is selected to be the first woman trainee, and she is thrust into the Navy SEAL-like Combined Reconnaissance Team program, considered the most arduous training regime offered by the military. Command Master Chief Urgayle (Viggo Mortensen) runs the brutal training program, and with Jordan the only woman in a class full of male recruits, she is not expected to survive even the first week. Initially Jordan is provided with special treatment to help her compete, but she rejects the privileges and insists on being treated exactly like the men. With a determined Jordan making surprising progress through the physically punishing and mentally draining program, her success starts to make waves in Washington DC, where DeHaven is facing another crisis that will require more deal making. Whenever G.I. Jane tries to expand its horizons beyond the training course, it stumbles awkwardly. The scenes in Washington featuring Senator DeHaven and a large group of faceless defence department suits never move beyond the most obvious theatre. Jordan's home life and romantic relationship is hard boiled in scenes so brief that next to nothing is known about her as a person. And the film ends with the ever so tiresome bromide of a class full of trainees suddenly thrust into a poorly defined actual combat mission. Hello undefined bad guys running around in the Libyan desert. The film therefore lives and dies in the training program that Jordan and her fellow recruits are subjected to, and here director Ridley Scott does shine. The exercises designed to harden the trainees into well-honed fighting machines capable of withstanding whatever nature and enemies throw at them are long, detailed and almost physically exhausting to watch. Scott deploys his usual expertise in shadows and back-lighting, and along with cinematographer Hugh Johnson the film is bathed in spectral blue-green representing the nighttime home of special forces. G.I. Jane is at its best when there is little dialogue and plenty of physical effort on display. Whenever the film moves towards humanizing the tension between Jordan, Urgayle and the many interchangeable men surrounding her it becomes obvious that the script (by David Twohy and Danielle Alexandra) is firmly stuck in first gear, and none of the characters can say anything or display any emotions beyond basic "women don't belong here / yes they do" clipped exchanges. Demi Moore deserves a lot of credit for undergoing an intense physical training program to get in shape for the role of Jordan O'Neil. She shaves her head on-screen, performs all her own stunts and enjoys plenty of scenes showing off her buff body being put through the exhaustive training grind. Her acting is admirably intense, but that is all. G.I. Jane never succeeds in revealing much about Jordan except that she starts out resolute and gets ever more tenacious, in proportion to the number of people who want her to fail, and Moore is stuck in that box. Viggo Mortensen provides an interesting angle on the traditional ruthless training instructor persona, but the script cannot deliver an evolution to his poetry-loving ferocity. G.I. Jane succeeds as an inside look at what it takes to be an elite soldier, but otherwise misfires when it comes to creating people and a story worth caring about.